I am sure you will have all seen the amazing dresses from Self Portrait, the premium brand that took Instagram by storm last year. 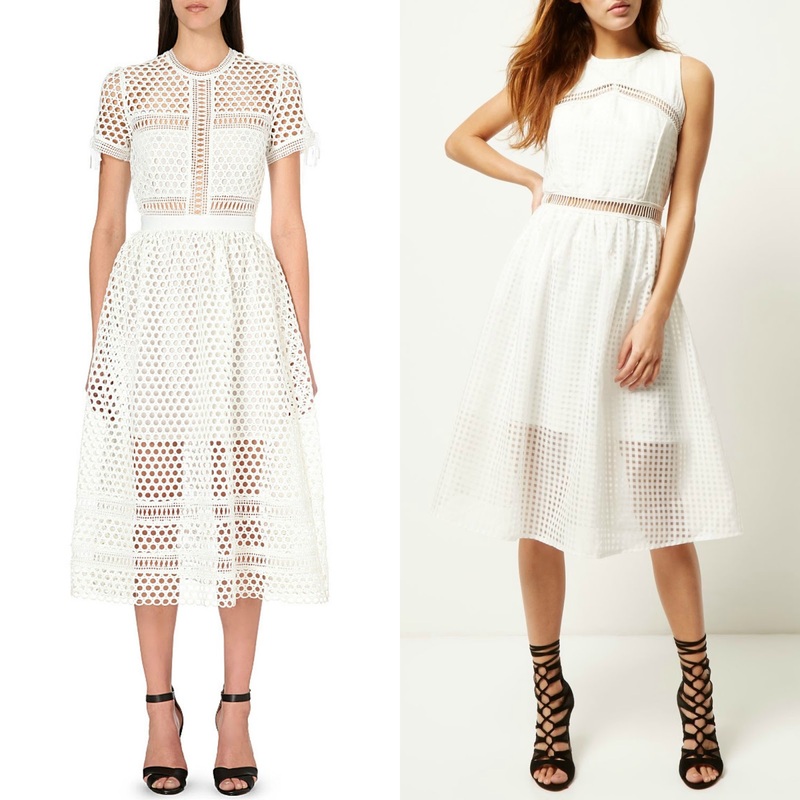 After seeing some of my style icons sporting this midi white lace dress I like many i am sure, fell in love. Just the right amount of flesh on show but still uber feminine and chic but at over £300 i do not have the money or occasion for such a piece. I was however excited when i found a great highstreet alternative - midi length, white with layered lace detailing, overall a pretty good dupe don't you think? The dupe is from River island and coming in at £80 is a much more purse friendly way to wear this lace style, white dress. Not quite as beautiful as the original but definitely has potential - with cut out detailing at the waist and shoulders, it would make a lovely summer dress. Hoping to find in-store soon so i can try on (keep watching my Instagram will post pics). Would you save with the River island version or splurge on the original self portrait style? I totally agree, white lace is gorgeous and perfect for the warmer weather. So my prom is coming up in May and I found this white lace dress that I fell in love with. I'm just hesitant to get it because I'm not sure if it would be appropriate for my prom. It's not WHITE white. But it was so pretty in person. I feel like people might think it's too wedding-y. Can one wear white to prom?